Its finally here! 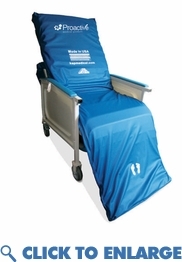 An advanced hospital grade alternating pressure mattress that is designed for use on a recliner chair. This alternating pressure mattress system is designed to treat and heal all bed sore stages. The adjustable pump is whisper quiet and supports up to 450 lbs. The pump can be placed into a static or alternating pressure mode.